The UN would be effective in settling international disputes, if some member-states didn’t try to use it for dominating world affairs, Russian Foreign Minister believes, adding that such efforts led to bombings in Serbia, war in Iraq and chaos in Libya. Sergey Lavrov has called for the UN, about to celebrate its 70th anniversary, to be an independent and effective leader in global decision-making, despite attempts by some of its members to usurp the organization’s functions. “It’s time to answer the question: do we really want the see the UN an effective and influential instrument of preserving peace and security or are we ready to allow it turn into the arena of propagandist struggle, with the UN being excluded from the process of finding key solutions to international problems,” Lavrov said, at the open debate for the United Nations Security Council (UNSC), held on Monday in New York. Lavrov listed episodes in recent history, which he sees as violations of the UN charter, caused by a will to dominate world affairs. “It’s enough to remember the bombings of Serbia, the occupation of Iraq under a false pretext... and the rude manipulation of the Security Council mandate leading to destruction and on-going chaos in Libya,” the minister said. 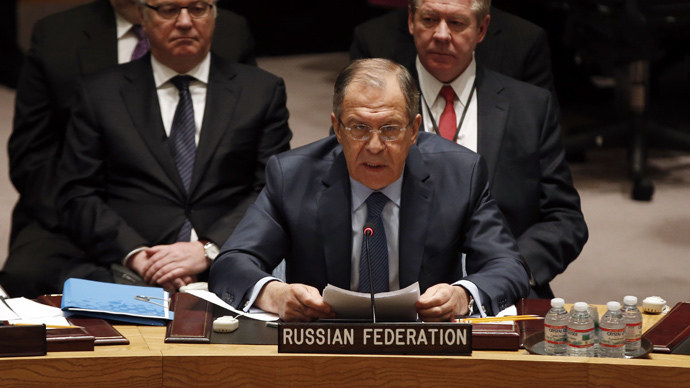 The Russian Foreign Minister has denounced attempts at either turning the UNSC into a body for unconditional and bulk approval of decisions made by the “leader,” or for making it steer away completely from decision-making. "Such approaches are in no way keeping with the principles on which the UN is based," and counter an objective tendency of spread of global economic and political might, Lavrov added. The UNSC resolution, clamping down on funding of the so-called Islamic State (IS, formerly ISIS), initiated by Russia and approved earlier this month is one of the positive examples of the council’s independent work, Lavrov believes. The resolution on eliminating chemical weapons in Syria is another such example, according to the minister. Several officials referred to the times of the Cold War in their speeches at the Monday UNSC meeting, expressing their concerns that such confrontation is not yet history. "The use of sanctions mechanisms in line with the statutes attributes to the exclusive competence of the Security Council. Unilateral restrictive measures and attempts of exterritorial use of national legislation are nothing more than a manifestation of archaic, bloc ways of thinking," Lavrov said. Chinese Foreign Minister Wang Yi – who chaired the debate, as China holds the rotating presidency of the UN Security Council for February – called the Cold War mentality worth "the ash heap of history." Relations between the countries should be built upon principles of equality and cooperation, he said, adding that "no country in the world has the right to impose its will upon others and displace legitimate governments." Wang Yi also warned the countries of the threats of the use of military power, and expressed concerns over continuing attempts to rewrite history by bettering the reputations of Nazi criminals. Dozens of countries – not only UN Security Council members – took part in the meeting, which was initiated by China and was aimed at discussing key security issues and emerging threats while the world celebrates the 70th anniversary of the end of World War II. On the sidelines of the Security Council open debate, Russia's Sergey Lavrov met with UN Secretary-General Ban Ki-moon. While in New York, Lavrov also held meetings with the foreign ministry officials of China, Uganda, Venezuela, Serbia, and New Zealand.